NEXUS recital programs are approximately two hours in duration with a 15-minute intermission. 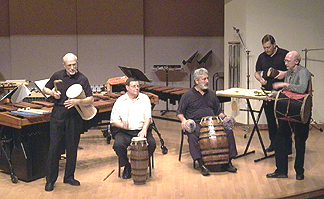 The music draws from NEXUS’ rich and varied repertoire of jazz and novelty ragtime music, ethnic music (works based upon drumming from India and Africa), improvisation, and contemporary works written for NEXUS by composers such as Steve Reich, John Cage, Gavin Bryars, Toru Takemitsu, and NEXUS members themselves. Music for Pieces of Wood relies on the composer’s process of ‘rhythmic construction’, or substitution of beats for rests in a rhythmic pattern. The piece requires five performers each playing a tuned pair of large wooden dowels called claves. One player maintains a steady pulse throughout the piece while another performs a short rhythmic pattern over and over. One by one the other players build up this same pattern one note at a time, but several beats out of phase with the original pattern. This process is carried out in three sections with patterns of six, four, and three beats. Telisi Odyssey is based on the South Indian kriti, Telisi Rama, by the great Carnatic composer Tyagaraja (1767-1847). The harmonies are derived from Raga Purnacandrika, and the accompanying rhythms are adaptations of the rhythmic patterns from the mrdangam, the principal drum of South Indian classical music, and from the rhythmic patterns used in Akom, a spirit possession music from the Akan people of Ghana. Tongues Traditional (Zimbabwe)/arranged by NEXUS. The featured voice in this music is the African mbira, an instrument whose name literally translates as ‘tongues’, albeit tongues of metal rather than flesh. It is a type of plucked idiophone found throughout Africa and sometimes called a ‘thumb piano’ in the west. The mbira performing the leading part is a 22-keyed Shona mbira, known as ‘mbira dza Vadzimu’ (mbira of the ancestral spirits). Accompanying instruments include a marimbula (bass mbira from the Caribbean Islands), gankogui (iron bell), Axatse (gourd rattle) and a drum. The music is NEXUS’ own interpretation of a traditional Zimbabwean melody. In the Shona culture of Zimbabwe, the mbira is strongly associated with memories of departed ancestors and with the experience of remembering in general. Other trials now are here. Copyright 1992, Schott Japan Company Ltd. The earth is round, I tell you. The apple is red, I tell you. The desert is big, I tell you. I’m telling you, the pyramid is a triangle. I’m telling you, it’s a little star! Russia is huge, I tell you. I’m telling you, the balalaika is a triangle! Copyright 1984 Schott Japan Company Ltd.